Light therapy also known as Photodynamic Therapy, has been studied for more than 40 years worldwide during which time it was discovered that visible and infrared light has positive therapeutic benefits to living tissues and organisms on a cellular level to promote different levels of tissue healing and regeneration. Clinical tests, carried out by NASA, Stanford University and the Mayo Clinic have also found that light energy (photon therapy) can help relieve pain and inflammation from disease based conditions, physical trauma, work related stress, training or other high performance activity. Anti-Ageing: Once the light is absorbed it accelerates the cells biochemical circulation and stimulates the production of collagen helping to plump out the skin and over time reduce the appearance of wrinkles. Aches & Pains: LED Photon light can penetrates the skin to help treat tissues from this inside out, resulting in the inflammation and muscular aches and pains been treated. What is LED Photon Light Therapy? Light is a form of energy that is measured as a stream of particles called photons. There are different types of photons light energies, they are measured and form part of the Electromagnetic Spectrum, of which visible light is one. The wavelength of the light is measured in nano-metres (nm) and different wavelengths will interact with matter in different ways. An example would be X-rays which pass through the soft tissues allowing doctors to see inside the body. The visible spectrum, which is the spectrum used for LED Photon light therapy ranges from 400nm (violet) to 700nm (red). There is no risk of damaging the skin or tissue as the power levels used for LED light therapy are not as strong as those used in IPL/Laser treatments. By exposing the light to the skins surface the skin’s photoreceptors are activated and let the skin cells absorb the energy. The skin will then react to the light in different ways depending on the wavelength and colour of the light. Although there are no time limitations for photon light therapy it is recommended a client has a minimum of 30 minutes light exposure per session. Light therapy does not give instant results and therefore it is recommended that the client commits to a minimal of 5 treatments, for optimum results it is advised that a full course of treatment, 10 – 12 sessions are taken. Treatments can be taken every 72 hours, although do not leave more than 1 week between treatments. After completing the light therapy treatment, monthly interim sessions can be taken to maintain the skin condition, although this is not essential. A solid block of colour for a fixed period of time has been shown to be more effective than alternating colours. The following are the different photo light colours and the conditions they treat. 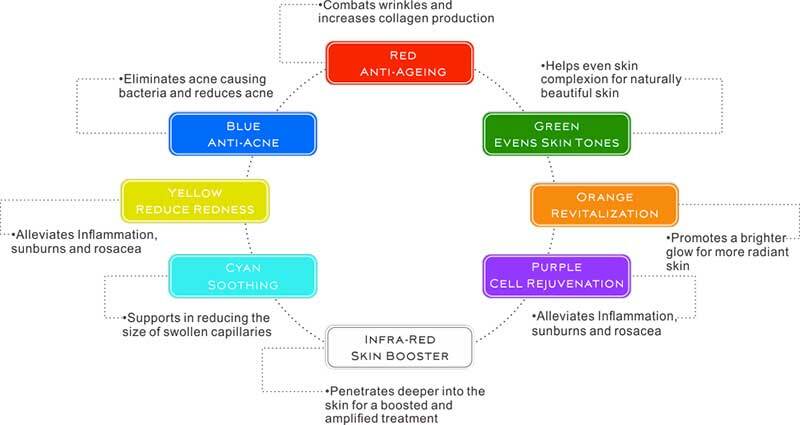 Red light, also known as the ”Biologically Active Light”, is primarily used as an anti-inflammatory, for stimulating cell activity and for increasing production of collagen and elastin. Red LED light is very popular in the battle against ageing as it provides a reduction in the appearance of fine lines and wrinkles. Red light has also been found to be very healing and can be used to ease muscular pain and help speed up recovery following illness or injury. Blue light is an antibacterial agent which can kill the P acne bacteria beneath the skin and has anti-inflammatory properties. It targets poryphins, the metabolic product of propionibacterium bacteria, by reducing proteins, resulting in the bacteria been killed without damaging your skin tissue by production of an oxygen free radical. In a very short period of time the signs of acne are significantly reduced and inflammation is reduced. It decreases skin oiliness by lowering excess sebum production to achieve acne inflammation reduction and help to repair the skin. Blue LED light offers a viable alternative to medication in the fight against acne. Green light primarily increases melanin, reduces redness including rosacea and has the functions of neutralisation, balance and calming. Green light can reduce skin oil secretion, freckles, sun damage, and age spots. It lightens and reduces existing pigmentation and helps to improve skin tone and texture. White light speeds up metabolism of the active tissues and increases absorption. White light can also strengthen the protein fibre tissues, shrink enlarged pores and promote the synthesis of protein and collagen. Cyan light is a combination of blue and green lights, that gradually enhance cell energy. Helping to promote skin cells’ metabolism and adjust the gland function of skin, helping to improve oily skin and acne. Cyan light promotes the synthesis of protein and collagen in the skin and is primarily used as a skin illuminator. The purple light is a combination of red and blue light that causes strengthening of the protein fibre tissues and the minimisation of pores. 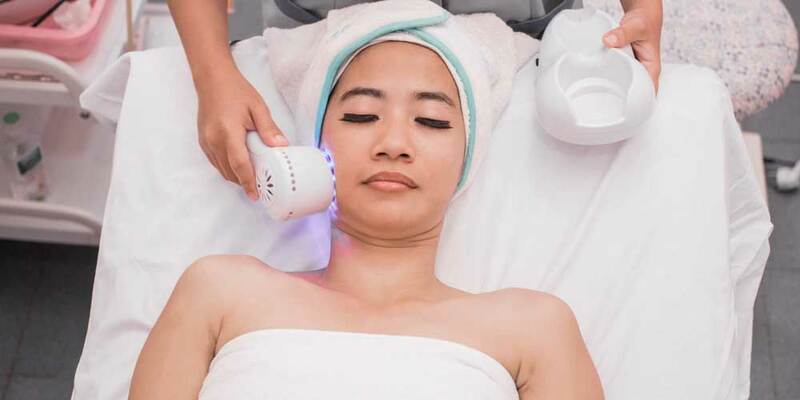 Purple light has shown particularly good results in the treatment of acne and for the removal of acne marks and also helps to reduce edema (inflammation or swelling). How is LED light different to Laser? The beams of light emitted from lasers are highly focused, dense and concentrated and are designed to target small areas at a time. The laser then heats the underlying tissue causing inflammation, resulting in the body to heal itself with new skin cells. Laser treatments often require anaesthesia resulting in enough inflammation to require a significant recovery period. However if laser treatment is done improperly, they can cause injury and scarring to the skin. LED light therapy poses none of these risks, as LED light is not as dense or concentrated as laser. LED light therapy targets a much wider area than lasers, and while it does penetrate into the tissues, it does not heat, cause inflammation or damage to the skin cells. During LED (Light Emitting Diode) Light Therapy? Before LED Phototherapy you will have a consultation, where your skin and problem areas will be assessed by our aesthetic practitioner. The practitioner will discuss your goals and exceptions and be able to comment on what results you can expect to achieve and if any other more effective treatment is required. For example, fine lines and wrinkles can be treated with HIFU or our Non-Surgical Face Lift. 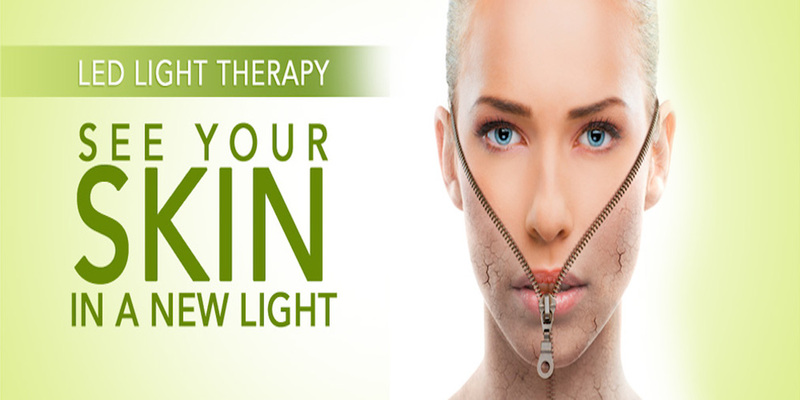 Before the LED Phototherapy is started the aesthetic practitioner will ensure that all skin care products, creams and make up are removed so that the light emitted is fully absorbed by the skin. Collagen cream or acne cream is then applied depending on treatment, this enhances the quality of the skin and helps treat those problem areas. The LED mask is placed over the face, emitting light waves to activate skin cells, treatment last approximately 30 to 50 minutes depending on the treatment area. At the end of treatment the aesthetic practitioner will apply an active serum to the face and any problem area treated. Results may be seen within a 48 hours and can last 6 – 12 months following a course of LED Photon Light Therapy. Maintenance treatments are may be required to ensure optimum results*. Cleanse, tone and moisturise your face morning and night with the right products for your skin; this will help to prevent loss of moisture, protect the skin from make-up through the day helping to keep the skin soft and supple as well as removing dirt and make up from the skin at the end of the day. Drink plenty of water (Recommended 2 – 3 litres). Eat a healthy, balanced diet, including at least 5 portions of fruit and vegetables. Do not undertake any other facial skincare treatments within 48 hours prior to having a LED light therapy. Avoid smoking and alcohol for 48 hours prior to your appointment. Avoid UV exposure / sun-beds for 7 days prior to treatment. Do not undertake any other facial skincare treatments within 48 hours of having a LED light therapy. Avoid UV exposure / sun-beds for 7 days after treatment. Red light therapy is considered to be a safe and well-tolerated therapy for the relief of symptoms of multiple conditions. The technology has even been used by NASA. Unlike using salon tanning beds, red light therapy does not utilise harmful ultraviolet (UV) light which can damage skin and cause cells to mutate. Light therapy technology is safe and clinically proven to be gentle to skin. There are no known side effects and the technology has even been used by NASA. In a clinical study, results were seen in as little as one week and continued to improve over time. Best results are seen after 12 weeks of use, 1 session per week. RT Aesthetics encourage all our clients to complete the full course of treatment, or at the very minimal complete 6 full sessions. If you require anymore information then please contact us or book a free consultation. Does the treatment work on all types of acne? Pimples? Blackheads? Whiteheads? Can this work on (SAD) Seasonal Affective Disorder? Light therapy is a great way to treat seasonal affective disorder (SAD) and certain other conditions by exposure to artificial light. SAD is a type of depression that occurs at a certain time each year, usually in the fall or winter, although some clients experience this during the summer. RT Aesthetics encourage all our clients to complete the full course of treatment, or at the very minimal complete 6 full sessions.